Welcome back to my next technique video for Distress Oxide 101. Have you seen all the other technique videos yet? Justine created a stunning card in her first video. In yesterday’s video I colored an envelope with Distress Oxide and created a matching card for it. In my second video, I’m showing different ways on how to create your own colored texture paste using the Oxides. Wow, 3 great techniques and one more to come. Check out Justine’s channel tomorrow (April 7th) for the last part of the series. Btw, Justine is celebrating 1 million views on YouTube. If you haven’t joined the YouTube hop to celebrate her, you should. There are a ton more prices to win. Start with the hop here. 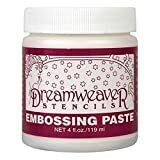 Stampendous Dreamweaver Regular Paste, 4oz. cardmaking, Distress Oxide, Ink Blending, Introduction, Mixed Media, Nuvo, Prima Marketing, review, So Suzy Stamps, Stencil, tim holtz. Bookmark. The cards turned out so pretty. I love how the pasted worked so well with the inks. Love the card that u made using the distressed oxide inks and chalkboard paint and a butterfly stencil! Beautiful! Right now my favorite Oxide technique is smooshing! I love the look of it. LOVE the cards you made with the Distress Oxide inks and texture pastes! I’m going to try this myself! Thank you! New to everything stamping, watercolor, etc. Am simply blown away by the combinations and possibilities using hundreds of different projects. It is so wonderful that so many artists, like yourself, are willing to share your time, talent, skills and product reviews. It ultimately saves all of us so much time trying to decide what to get and how to use it well and efficiently. Not to mention all the wonderful ideas to get us charged up and going. Can’t thank you enough. I like using the stencils for the background! Great video. These new inks sure seem versatile. Thanks for showing several techniques. Loved all the inspiration in this video! I’m always interested in ways to stretch/combine supplies. You have some wonderful stencils in your collection. The bunnies turned out really cute, and the black-board butterflies were a surprise! I’ve never though about using a stencil for two-step colouring like that. I’m really glad to have found your blog, through Justine. These oxide inks look sooo fun! Thank you for showing them in so many creative ways! I loved watching you experiment and I too am a fan of saving money and using what I already have, so I will be trying this technique out for sure! I never thought about using my distress inks with stenciling paste. I can’t wait to try this! Thanks for the inspiration. Love all of your techniques and cards! Thank you! Congrats to the lucky winner! I love the look of the inks mixed with embossing or texture paste…. such pretty colors! Love the way that the distress oxcide ink colors the paste, so different than the distressed inks! What a great way to use the stencils! Beautiful Cards. Loved watching how you used two different colors of your DIY pastes on the cards. Your combinations are great. Love the beautiful cards and the techniques! Thanks for sharing!! Bunnies and butterflies are my favorite. Hi lovely cards and with great techniques and those inks are undoubtedly cool…thanks for showing different ways to use them!! Ohhhhhhhhhhh those butterflys are great. I so wanna try embossing paste. I love the way mixed media looks. Love your gorgeous cards!!! Beautiful inks!!! Loved all the mediums you used. The bunnies are adorable and the butterflies were a great idea! Also love the tip about tying the ribbon. An array of fabulous cards; so glad you shared how the inks pair with other mediums! I love the cards and my favourite one is the one made with the 3D gloss gel, the colours are so pretty together. I just loved your use of the mediums with the inks. I love how the distress inks blend and adding some water spritz can completely change the look. Loved your cards! Got my 3 favorite colors of distress oxide reinkers to try them out. They were cheaper and in stock! If I like them as much as I think I will it would be nice to have them all. Great video on the distress oxide inks, These would be great to have in your craft stash, you can do so much with them, TFS, Cheers Anna. I love this technique! I’ve always been a little scared of the texture paste but you make it look so easy, now I’m inspired to go play with mine! I think the biggest impact with these inks is with backgrounds but I have a lot more to learn about these. Thanks for the giveaway! Love how the cards came out! The bunnies are stinking cute, and those butterflies!! This is such a great technique!! I’m going to have to try this in my bible! Thanks for a great video — love that you used several different texture media and stencils — lots of possibilities! Love your cards. I love ink blending but now I am goin bbq yo have to try the texture paste. So many great ideas! Thank you for sharing! This will be an instant favorite because I have the paste, the inks, and need to add more texture to some of my backgrounds. Thanks for the share! You’re the best! Your video was so much fun to watch! Great cards. Thanks. I finally got my first Distress Oxide ink. I am playing with it, but my results weren’t nearly as spectacular as yours! These are beautiful! LOVE the butterflies! (I have a TH burlap stencil that catches the blenders all the time, ugh…) Do you find the distress oxide reacts any differently with the various pastes than regular distress inks? … and so far my favourite oxide technique is to look at the two I have! 😛 Need to play with them more. Great video you did here and how fun to use the distress oxide inks..Pretty cards you make too..Thank you for this fun chance with your giveaway.. Thanks for showing us how to use the distress markers with the paste. Never thought of that, I need to try it. Your cards and videos were great. I subscribed to your You Tube channel. I just got my Oxide inks today (only 8). I can’t wait to try them out with texture paste! Thanks for the inspiration. I hadn’t thought of mixing up embossing paste with the Distress Oxides, but your examples really turned out great! I love how easy ink blending seems to be with these inks!! And the smooshing technique is of course always fun! Beautiful cards!! I love all techniques but my favorite is smoothing and paste mixed with ink. Great way to use the Oxide Inks, giving this technique a try. My favorite color is Wisteria. Brilliant! Why didn’t I think of that?? Love the way it came out in all the different mediums and also really like the cards you created out of all the backgrounds. What fun! I need more color of Oxide! I couldn’t get the video to loaf but I can guess with the tools and the results enough to try it out and what fabulous results can be achieved! Thanks for doing this video series. I just finished watching your texture paste distress oxide video. I love this. Time to break out some stencils! Hard to pick a favorite color but I’m partial to the wilted violet and worn lipstick. Thanks for your videos! Love, love the butterflies! Seeing how the pastes work with distress oxide is wonderful. I had no clue as to how this works….as usual, you’ve answered all my questions. Thank you so much for your videos. I like the smooshing technique best. I really like the stenciling with paste and the distress oxides! Wow!! Love the combination of the paste and the distress oxide inks – this is one of my favorite techniques with distress inks, so I can only imagine the next level the oxide inks take it to! Thank you for sharing your beautiful video! Stamping with the oxide inks is a great technique, but my favorite is still to make beautiful backgrounds! Love stamping with stencil to make a beautiful background. The cards are so pretty! Thank you for the wonderful video. Your cards are beautiful, and you’ve made me want to pull out my embossing paste and get busy.